Recent tectonic joint intersects older exfoliation joints in granite gneiss, Lizard Rock, Parra Wirra, South Australia. A joint is a break (fracture) of natural origin in the continuity of either a layer or body of rock that lacks any visible or measurable movement parallel to the surface (plane) of the fracture. Although they can occur singly, they most frequently occur as joint sets and systems. A joint set is a family of parallel, evenly spaced joints that can be identified through mapping and analysis of the orientations, spacing, and physical properties. A joint system consists of two or more intersecting joint sets. The distinction between joints and faults hinges on the terms visible or measurable, a difference that depends on the scale of observation. Faults differ from joints in that they exhibit visible or measurable lateral movement between the opposite surfaces of the fracture. As a result, a joint may have been created by either strict movement of a rock layer or body perpendicular to the fracture or by varying degrees of lateral displacement parallel to the surface (plane) of the fracture that remains “invisible” at the scale of observation. Joints are among the most universal geologic structures as they are found in most every exposure of rock. They vary greatly in appearance, dimensions, and arrangement, and occur in quite different tectonic environments. Often, the specific origin of the stresses that created certain joints and associated joint sets can be quite ambiguous, unclear, and sometimes controversial. The most prominent joints occur in the most well-consolidated, lithified, and highly competent rocks, such as sandstone, limestone, quartzite, and granite. Joints may be open fractures or filled by various materials. Joints infilled by precipitated minerals are called veins and joints filled by solidified magma are called dikes. Joints result from brittle fracture of a rock body or layer as the result of tensile stresses. These tensile stresses either were induced or imposed from outside, e.g. by the stretching of layers; the rise of pore fluid pressure as the result of either external compression or fluid injection; or the result of internal stresses induced by the shrinkage caused by the cooling or desiccation of a rock body or layer whose outside boundaries remained fixed. When tensional stresses stretch a body or layer of rock such that its tensile strength is exceeded, it breaks. When this happens the rock fractures in a plane parallel to the maximum principal stress and perpendicular to the minimum principal stress (the direction in which the rock is being stretched). This leads to the development of a single sub-parallel joint set. Continued deformation may lead to development of one or more additional joint sets. The presence of the first set strongly affects the stress orientation in the rock layer, often causing subsequent sets to form at a high angle, often 90°, to the first set. Joints are classified either by the processes responsible for their formation or their geometry. The geometry of joints refers to the orientation of joints as either plotted on stereonets and rose-diagrams or observed in rock exposures. In terms of geometry, three major types of joints, nonsystematic joints, systematic joints, and columnar jointing are recognized. Nonsystematic joints are joints that are so irregular in form, spacing, and orientation that they cannot be readily grouped into distinctive, through-going joint sets. Systematic joints are planar, parallel, joints that can be traced for some distance, and occur at regularly, evenly spaced distances on the order centimeters, meters, tens of meters, or even hundreds of meters. As a result, they occur as families of joints that form recognizable joint sets. Typically, exposures or outcrops within a given area or region of study contains two or more sets of systematic joints, each with its own distinctive properties such as orientation and spacing, that intersect to form well-defined joint systems. Based upon the angle at which joint sets of systematic joints intersect to form a joint system, systematic joints can be subdivided into conjugate and orthogonal joint sets. The angles at which joint sets within a joint system commonly intersect is called by structural geologists as the dihedral angles. When the dihedral angles are nearly 90° within a joint system, the joint sets are known as orthogonal joint sets. When the dihedral angles are from 30 to 60° within a joint system, the joint sets are known as conjugate joint sets. Longitudinal joints – Joints which are roughly parallel to fold axes and often fan around the fold. Cross-joints – Joints which are approximately perpendicular to fold axes. Diagonal joints – Joints which typically occur as conjugate joint sets that trend oblique to the fold axes. Strike joints – Joints which trend parallel to the strike of the axial plane of a fold. Cross-strike joints – Joints which cut across the axial plane of a fold. Columnar jointing is a distinctive type of joints that join together at triple junctions either at or about 120° angles. These joints split a rock body into long, prisms or columns. Typically, such columns are hexagonal, although 3-, 4-, 5- and 7-sided columns are relatively common. The diameter of these prismatic columns range from a few centimeters to several metres. They are often oriented perpendicular to either the upper surface and base of lava flows and the contact of the tabular igneous bodies with the surrounding rock. This type of jointing is typical of thick lava flows and shallow dikes and sills. Columnar jointing is also known as either columnar structure, prismatic joints, or prismatic jointing. 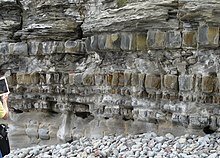 Rare cases of columnar jointing have also been reported from sedimentary strata. Joints can also be classified according to their origin. On the basis of their origin, joints have been divided into a number of different types that include tectonic, hydraulic, exfoliation, unloading (release), and cooling joints depending on the specific author and publication. Also, the origin of many joint sets often can be unclear and quite ambiguous. Often, different authors have proposed multiple and contradictory hypotheses for specific joint sets and types. Finally, it should be kept in mind that different joints in the same outcrop may have formed at different times and for different reasons. Tectonic joints are joints that formed when the relative displacement of the joint walls is normal to its plane as the result of brittle deformation of bedrock in response to regional or local tectonic deformation of bedrock. 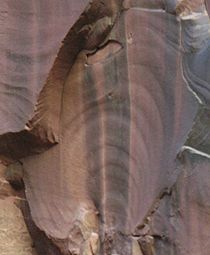 Such joints form when directed tectonic stress causes the tensile strength of bedrock to be exceeded as the result of the stretching of rock layers under conditions of elevated pore fluid pressure and directed tectonic stress. Tectonic joints often reflect local tectonic stresses associated with local folding and faulting. Tectonic joints occur as both nonsystematic and systematic joints, including orthogonal and conjugate joint sets. Hydraulic joints are joints thought to have formed when pore fluid pressure became elevated as a result of vertical gravitational loading. In simple terms, the accumulation of either sediments, volcanic, or other material causes an increase in the pore pressure of groundwater and other fluids in the underlying rock when they cannot move either laterally of vertically in response to this pressure. This also causes an increase in pore pressure in preexisting cracks that increases the tensile stress on them perpendicular to the minimum principal stress (the direction in which the rock is being stretched). If the tensile stress exceeds the magnitude of the least principal compressive stress the rock will fail in a brittle manner and these cracks propagate in a process called hydraulic fracturing. Hydraulic joints occur as both nonsystematic and systematic joints, including orthogonal and conjugate joint sets. In some cases, joint sets can be a tectonic - hydraulic hybrid. Exfoliation joints are sets of flat-lying, curved, and large joints that are restricted to massively exposed rock faces in an deeply eroded landscape. Exfoliation jointing consists of fan-shaped fractures varying from a few meters to tens of meters in size that lie sub-parallel to the topography. The vertical, gravitational load of the mass of a mountain-size bedrock mass drives longitudinal splitting and causes outward buckling toward the free air. In addition, paleostress sealed in the granite before the granite was exhumed by erosion and released by exhumation and canyon cutting is also a driving force for the actual spalling. Unloading joints or release joints are joints formed near the surface during uplift and erosion. As bedded sedimentary rocks are brought closer to the surface during uplift and erosion, they cool, contract and become relaxed elastically. This causes stress buildup that eventually exceeds the tensile strength of the bedrock and results in the formation of jointing. In the case of unloading joints, compressive stress is released either along preexisting structural elements (such as cleavage) or perpendicular to the former direction of tectonic compression. 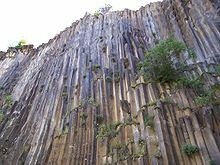 Cooling joints are columnar joints that result from the cooling of either lava from the exposed surface of a lava lake or flood basalt flow or the sides of a tabular igneous, typically basaltic, intrusion. They exhibit a pattern of joints that join together at triple junctions either at or about 120° angles. They split a rock body into long, prisms or columns that are typically hexagonal, although 3-, 4-, 5- and 7-sided columns are relatively common. They form as a result of a cooling front that moves from some surface, either the exposed surface of a lava lake or flood basalt flow or the sides of a tabular igneous intrusion into either lava of the lake or lava flow or magma of a dike or sill. Joint propagation can be studied using the techniques of fractography in which characteristic marks such as hackles and plumose structures can be used to determine propagation directions and, in some cases, the principal stress orientations. Some fractures that look like joints are actually shear fractures, which in effect are microfaults, instead of joints. Shear fractures do not form as the result of the perpendicular opening of a fracture due to tensile stress, but through the shearing of fractures that causes lateral movement of its faces. Shear fractures can be confused with joints, because the lateral offset of the fracture faces is not visible at the scale of outcrop or hand specimen. Because of the absence of diagnostic ornamentation or the lack of any discernible movement or offset, they can be indistinguishable from joints. Shear fractures occur in sets of planar parallel fractures at an angle of 60 degrees and can be of the same size and scale as joints. As a result, some conjugate joint sets may actually be shear fractures. In case of such joint sets, it might be possible to distinguish joints from shear fractures by looking for the presence of slickensides, which are products of shearing movement parallel to the fracture surface. The slickensides are fine-scale, delicate ridge-in-groove lineations that are found on the surface of fracture surfaces. 2, and NaCl, that formed most of Earth's ore deposits circulated within the Earth crust. As a result, understanding their genesis, structure, chronology, and distribution is an important part of finding and profitably developing ore deposits of various types. Finally, joints often form discontinuities that may have a large influence on the mechanical behavior (strength, deformation, etc.) of soil and rock masses in, for example, tunnel, foundation, or slope construction. As a result, joints are an important part of geotechnical engineering in practice and research. ^ Young, G.M. (2008) Origin of Enigmatic Structures: Field and Geochemical Investigation of Columnar Joints in Sandstones, Island of Bute, Scotland. Journal of Geology. 116(5):527-536. ^ Goehring, L., and S.W. Morris (2008) Scaling of columnar joints in basalt. Journal of Geophysical Research. B113:B10203, 18 pp. ^ Goehring, L. (2013) Evolving fracture patterns: columnar joints, mud cracks and polygonal terrain. Philosophical Transactions of The Royal Society A Mathematical Physical and Engineering Sciences. 371(20120353). 18 pp. Wikimedia Commons has media related to Joint (geology). Aydin, A., and J. Zhong (nda) Non-orthogonal Joint Sets, Multiple Joint Sets, Rock Fracture Knolwedgebase, Stanford University, Stanford, California. Aydin, A., and J. Zhong (ndb) Orthogonal Joint Sets, Multiple Joint Sets, Rock Fracture Knolwedgebase, Stanford University, Stanford, California. Aydin, A., and J. Zhong (ndb) Patterns of Multiple Joint Sets, Multiple Joint Sets, Rock Fracture Knolwedgebase, Stanford University, Stanford, California.